I blog, therefore I reflect. A blog is a reflection. But what about reflecting about blogging? Why should we blog? As professionals, learners, knowledge enthusiasts and digital citizens, blogging opens a new world for us. That is why I decided to think about my blogging. And, in the process, I found some interesting resources that helped me put my thoughts together. Picture attribution: Licht, NotionsCapital.com, Mike. Rosie the Blogger. 2007. Photograph. Flickr. Yahoo!, 14 May 2008. Web. 18 Apr. 2013. But, what really summarizes what I consider to be the key components of teacher blogging is beautifully explained in Henrietta’s wonderful Prezi. Thanks Henrietta! Why blogging? Blogging to become better educators, to improve our practices, to reflect on our approaches, to share, to showcase our classroom, and to provide a better educational experience day after day, year after year. 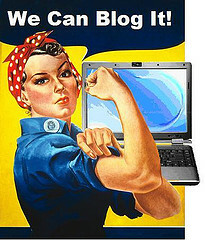 Blogging rocks!